Home \ Radio \ Larry King to Return to Radio? 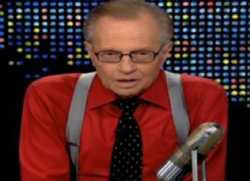 Larry King to Return to Radio? Larry King is reportedly plotting his next career move after he steps down from his nightly CNN talk show: a return to radio. TMZ reports that King has been talking with longtime pal Ryan Seacrest about creating a new syndicated radio show. Seacrest, who hosts his own radio programs, is looking to create a media empire that includes radio and television when his contract with radio giant Clear Channel expires in November. Radio, of course, is where King’s long broadcasting career began. He spent almost 40 years behind the microphone, going from a local gig in Miami to a nationally syndicated show that ran until 1994. King and Seacrest have long formed a mutual admiration society. King has made no secret of his wish to have Seacrest replace him when he ends “Larry King Live” this fall. The two also went to dinner this week. King tweeted about it, writing, “As always had a great time with @RyanSeacrest. He’s a class act & picked up the check for the whole table!” He did not mention, however, whether they discussed any radio deals.